As we start this week of the Thanksgiving holiday, I start cooking in stages. I’ve already cut up half of the bread for my holiday stuffing, made a loaf of “stuffing bread” (a simple italian bread recipe to which I add poultry seasonings and herbs) and will brown up the sage sausage that goes into my stuffing later this afternoon. I’m making as many things ahead of time as I can, so that my holiday won’t be entirely spent in the kitchen and away from my family. While I could just as easily have opened a can of cranberry sauce, this recipe is one that I started making last year and found it to be a wonderful addition to our holiday meal. It’s my Chardonnay Cranberry Sauce. Jelled and chilled (this recipe really does need to have time to sit in the fridge), this sauce can be used on sandwiches just as easily as it compliments a turkey dinner…. and it’s sooo much better than something out of a can! I start with a bag of cranberries and pour them into a saucepan. Remove a half cup of the cranberries and chop these fine and set aside for a bit. This year I added a half cup of blueberries to the cranberries, just for a little variety and a touch of sweetness. To the berry mixture, I added 1 cup sugar, 1 cup James River Cellars Reserve Chardonnay, some orange zest, a dash of nutmeg, a little salt and a bit of lemon juice. I set the heat to medium and simmered the mixture until the berries popped and the sauce began to thicken. I tend to get a bit impatient, waiting for the berries to all pop, so I like to use a potato masher to squish anything that hasn’t popped. Once the sauce is nicely thickened, add in the reserved chopped cranberries and stir to combine. You’re not heating these berry pieces through, so remove the sauce from the heat and allow it to cool before transferring it to a container and popping it into the fridge. This can be made a few days ahead of time, but you’ll want to use this within a week (if it lasts that long) after the holiday. Enjoy this yummy cranberry sauce… it’s become one of my favorite parts of our Thanksgiving and Christmas dinners! 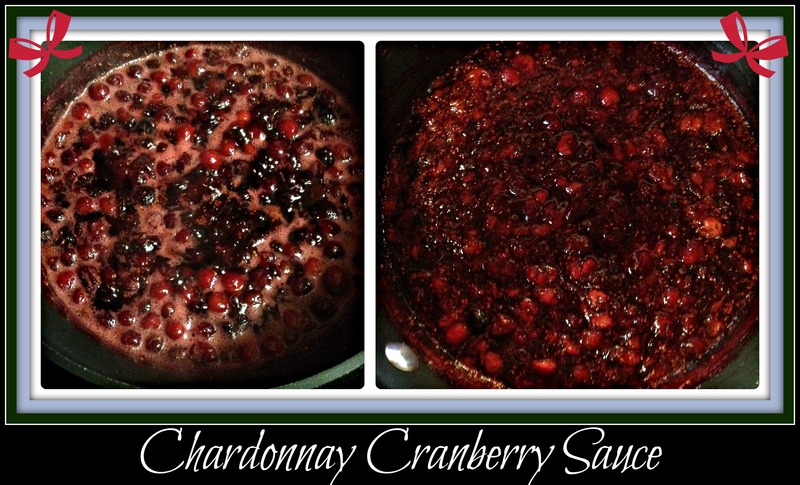 This entry was posted in Cooking, Recipe, Wine and tagged blueberries, cranberry sauce, easy recipe, holiday foods, James River Cellars Reserve Chardonnay, make ahead recipe, white wine.